What with summer schedules and other things, only four of us were at the July work party for Friends of North Beach Park. But it’s frequently the case that summer work parties are poorly attended. I mean, look at that sky! But those of us who were there got quite a bit done, and had a good time doing it. Plus, we were in the shade for the most part, so we kept cool as well. Our main task was to mulch an area that had been cleared at the EarthCorps work party two weeks previous. I think I’m finally learning that (a) tasks will take longer and be harder than I think they will; and (b) it’s better to have a loose idea — sometimes called “solution neutral” — of what to do, because in the discussion and working out, the group mind will inevitably come up with a better idea. 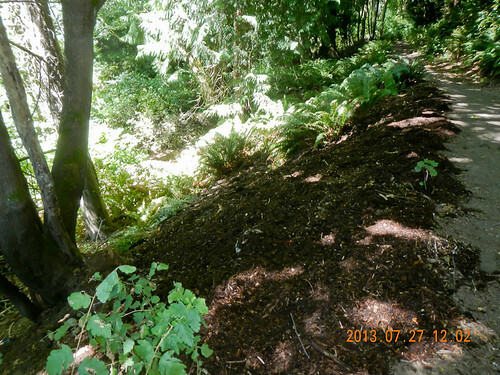 We put mulch on the downslope side of the main trail, starting at about 150 feet from the entrance to the park. At that end of the trail, the downslope side was not very steep. 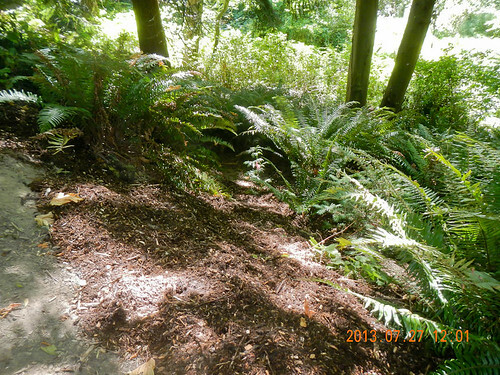 The main native plant here was sword fern, with a little low Oregon-grape. There have been a few restoration plantings, including a western red-cedar and a Douglas-fir. There had been very little ivy, but the plants there could use some comfort. Pretty much dead center in this picture is the aformentioned western red-cedar. It’s still short enough to be under the fronds of the sword fern. But it’s looking good despite the drought. 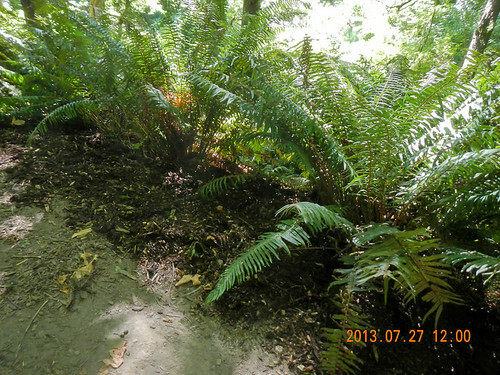 As we moved further up the trail, the slope got steeper, and the sword fern thinned out. We were entering an area where the ivy and sword fern had mixed. The last area we mulched was the beginning of the ivy monoculture on the very steep slope. We had a gravity assist for the mulching there. Dump the tarp or wheelbarrow full of mulch at the rim and watch it pour down. No need for raking! 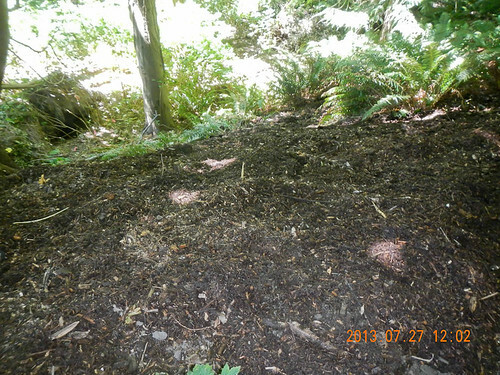 This picture shows the extent of the mulching. We finished the mulching for the day and had a little extra time, so we watered some plants that were looking a little peaked. Generally, plants should be left on their own. But we have a stream running through the park, so there’s no cost to the water. And it seems like even a little splash of water every week can greatly improve survival rates. The next Friends of North Beach Park work party is Saturday, August 24th, 9 a.m. to noon. Sign up on Cedar. We’ll also be at Art in the Garden on August 10th. Hope to see you at one of these events!